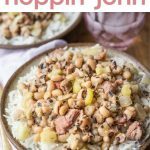 Pressure Cooker Hoppin’ John – create this classic Low country dish in next to no time in your pressure cooker! 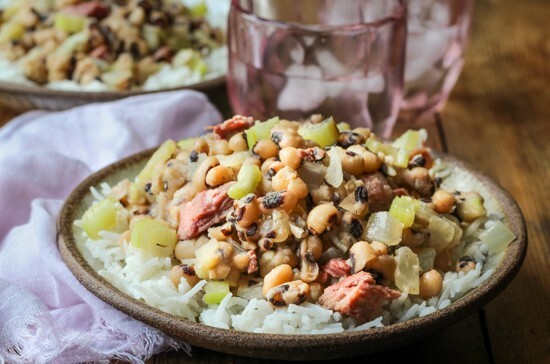 It’s the dish that black eyed peas are most well known for and now we’ve recreated a pressure cooker Hoppin’ John recipe with the usual traditional ingredients of rice, black eyed peas, onions and a smoked turkey leg for added flavor. It’s so easy to make this instant pot Hoppin’ John a fraction of the time that it normally takes on the stove, and we even have a quick cook method that works if you haven’t had time to pre soak the black eyed peas. 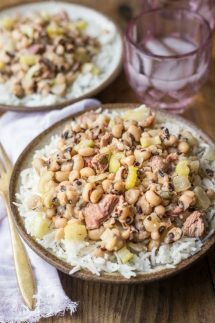 In the Deep South where I live, Hoppin’ John is a classic dish made with black eyed peas and is traditionally served on New Year’s Day as it’s thought to bring good luck in the New Year to those who eat it. It’s often served with Collard Greens, which you can also make in your pressure cooker! Also known as Carolina Peas and Rice, this is a very simple meal usually made with pork, rice and peas. It has been on the go for a very long time with the first recipe for Hoppin’ John appearing in Cookbooks as early as the 1840’s but slaves had been making some variation of pork, rice and peas for a long time before that. Hoppin’ John can be easily traced back to the Low Country of South Carolina before becoming popular all across the Southern United States. Where I live in Mississippi most people make it with Black Eyed Peas, but in South Carolina field peas are more commonly used. 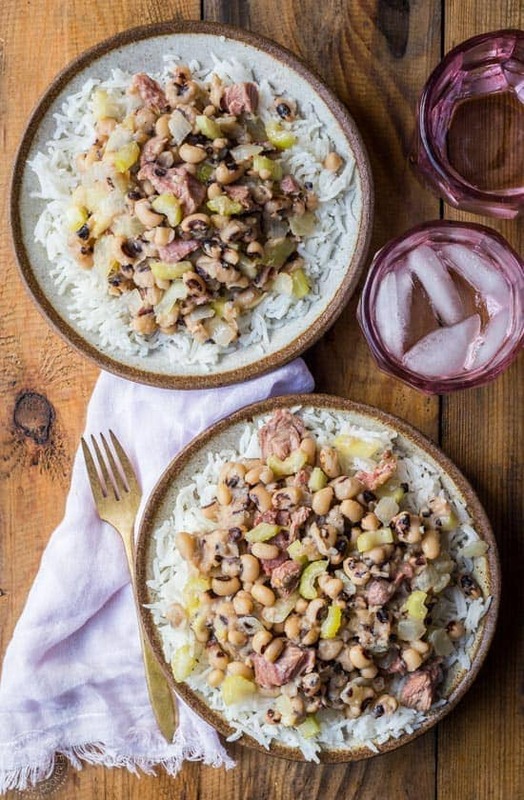 What are the ingredients for Pressure Cooker Hoppin’ John? The main ingredients for Southern Style pressure cooker Hoppin’ John are typically rice, peas of some kind, usually black eyed peas or field peas, and some type of smoky salty meat to flavor the peas as they cook, such as ham hock or smoked turkey leg. I cooked my pressure cooker Hoppin’ John the first couple of times with ham hocks and while the flavor was very nice they didn’t yield much in the way of additional meat to mix in with the rice and peas, so this time around I cooked them with a smoked turkey leg and it was much better! My Pressure Cooker Hoppin' John is perfect any day of the year, but it is traditionally served on New Years Day with Collard Greens. Watch my recipe video first! It's right below the directions. Add the dried Black Eyed Peas to your pressure cooker along with 6 cups of water. Lock the lid, turn the steam release vent to 'sealing' and using the manual setting, adjust it to cook for TWO minutes at High Pressure. As soon as the cook time is up carefully open the valve, strain and rinse the peas. Add 2 cups of water to your pressure cooker bowl. Set a trivet on top of the water and add one cup of jasmine or white rice to a suitable 'pot in pot' pan or bowl along with 3/4 cup water into and the rice. Lock the lid, turn the steam vent to 'sealing' and using the manual setting, adjust it to cook for SIX minutes at High Pressure. When the cook time time is up, allow the unit to reduce pressure on its own without opening the steam release vent (Natural Release or 'NPR') for TEN minutes, then release the remaining pressure and open the lid. Add a little oil to a skillet and saute the onions, celery, and garlic, for about five minutes or until soft, or you can saute them using the saute setting on your pressure cooker but I find it's faster to cook them on the stove while the rice is cooking, then you will be ready to cook the peas. Add the quick soaked (as detailed above) or presoaked black-eyed peas to the water the pot along with the bay leaves and 6 cups gluten free chicken broth then lock the lid, turn the steam vent to 'sealing' and using the manual setting, adjust it to cook for THREE minutes at High Pressure. NOTE: The three minute cook time assumes you've used my presoak method for the black eyed peas, the cook time may vary if you have not soaked them (you'll probably need more time) or if you have soaked them overnight and depending how long you soaked them. When the cook time is up, you can use a quick pressure release to open the steam vent. NOTE: If you leave the beans in after the cook time is up they will continue to cook and may be too soft for your tastes. If you find they are still a little hard after three minutes of pressure cooking you can gently simmer with a lid on for a little bit longer. Drain the peas and gently mix them together with the cut up smoked turkey leg, onions, celery, and garlic mixture. Season with salt and pepper, garnish with green onions if desired, and serve hot. If you don't like the texture of the turkey leg (my kids didn't) then crispy bacon pieces would be a good substitute to serve. I've tested this recipe multiple times and have based the cook time around the 'quick soak' pressure cooker method as outlined in the recipe. If you have presoaked the beans overnight then the cook time may be a little different depending on how long you've soaked them for. The desired level of 'doneness' will vary from person to person, this assumes you're using the quick soak method and should create soft but not mushy black eyed peas. You mention that there’s broth needed to pull the hopping John together a the end, but it’s not listed as Ain ingredient. How much did you use? Thanks! Thank you Raquelle, I totally missed that when I proofread the recipe and have added it now, it’s 6 cups of chicken broth.